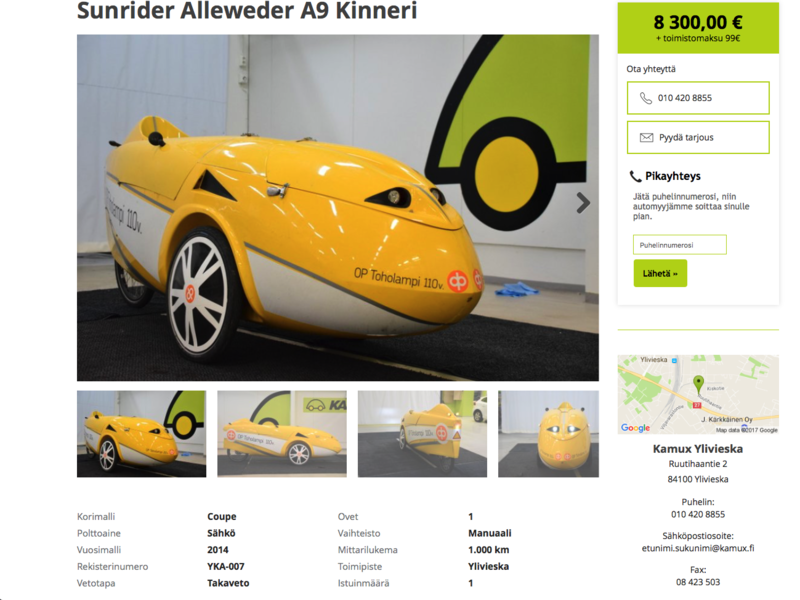 I noticed a few weeks ago that there is a E-assisted velomobile being sold in a car dealership in Ylivieska. 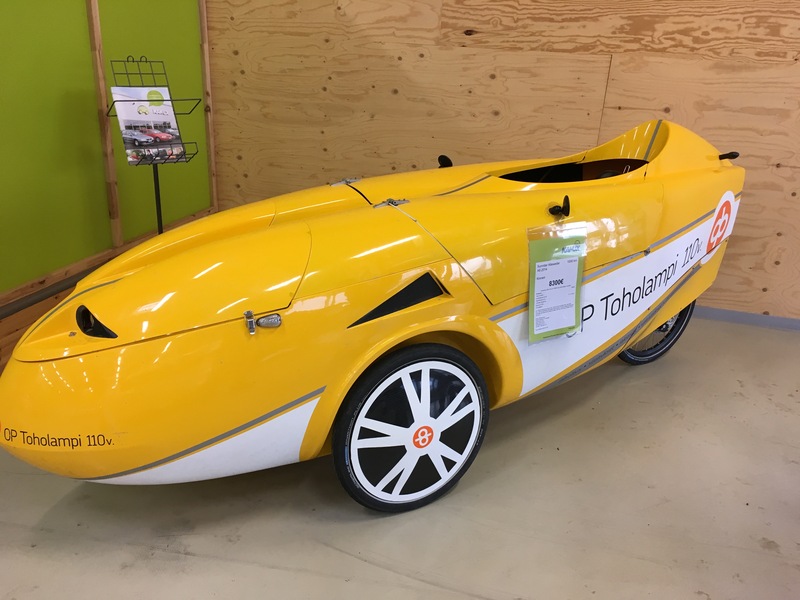 It’s very rare in Finland that velomobiles are being sold in car dealerships. But because Ylivieska is not far from my home, I just had to go and see. I’m not looking for a new velomobile, but my uncle is. We went to see whether it would be suitable for his first velomobile. We noticed right away that this Sunrider was a little shabby looking. Gelcoat coating was slightly cracked at the edges and maybe it was a bit faded. Considering that this was driven just over 500 kilometers, the appearance looked pretty worn-out. But this is from the year 2014 and this is apparently used as a show model in different events, so that’s why the shabby appearance. I went to short test ride. Electric assist and Rohloff gears work well. All seemed to be fine. 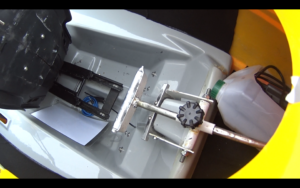 The body felt really stiff and sturdy compared to the Quest. 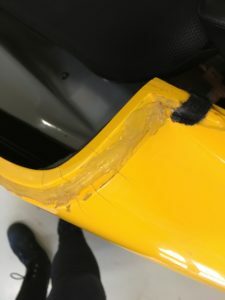 But the upper seat support was absolutely hopeless. The seat gave no support what so ever because it was swinging from side to side when pedaling. My uncle didn’t buy it yet. 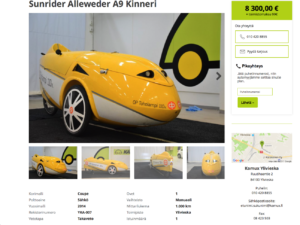 I think this price (8300 €) is a little bit too high for this fiberglass velomobile. At the same price you can buy a new, entirely carbon fiber, 20 kg lighter velomobile delivered to your door. But it does not include E-assist. We didn’t attempt to bargain the price, because they told us that this velomobile could be rented. Perhaps my uncle will rent this for a short time for testing. Here’s a short video of our Ylivieska trip. It sure is a lot of money for something looking like that! moi kun testasit sitä kinneriä tuntuiko siinä ilmanvastus samalta kun quest tai enemmän vai käytitkö siinä vain sähköavustetta? Sähköapua käytin koko ajan. Ja oli niin lyhyt lenkki, että ei kerennyt paljon aerodynamiikkaan perehtyä.